"Charlie and Kiwi: An Evolutionary Adventure." Cover art: Peter H. Reynolds. SciCom alumna Eileen Campbell, an exhibit and interpretive writer, has published a book on evolution for kids based on a exhibition she helped to create with the New York Hall of Science. 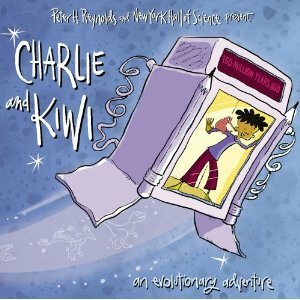 The book, titled Charlie and Kiwi: An Evolutionary Adventure, is aimed at children ages 7-12. It presents the basics of natural selection and bird evolution, including birds' connection to dinosaurs, through the eyes of Charlie, a young boy who is writing a report about his favorite bird, the kiwi. With help from great, great, great, great, great Grandpa Charles Darwin, Charlie travels back in time to the age of the dinosaurs to discover the kiwi's ancestors and evidence for how evolution works. Campbell, a 1983 graduate of the Science Communication Program, wrote the book as part of a traveling exhibition by the same name, developed with funding from the National Science Foundation. The exhibition will tour museums and other public-education facilities nationally through 2014. The book is illustrated by Peter H. Reynolds of Fablevision. Campbell is the principal of Farallon Media, based in Pacifica, California. The company, founded in 2001, provides writing, exhibit planning, video and web production for museums, parks, educational nonprofits, and other institutions that communicate with broad audiences. Prior to starting her company, Campbell worked at the Monterey Bay Aquarium during its first ten years. She also has consulted for the San Francisco Zoo. Campbell studied zoology and marine biology before enrolling in the Santa Cruz program in its second year. Earlier this year, Campbell received an award from the American Association of Museums for exhibit label writing for a display on the natural cycles of drinking water. She wrote the piece for Changing Earth, an exhibit that opened at the Franklin Institute in Philadelphia in March 2010.